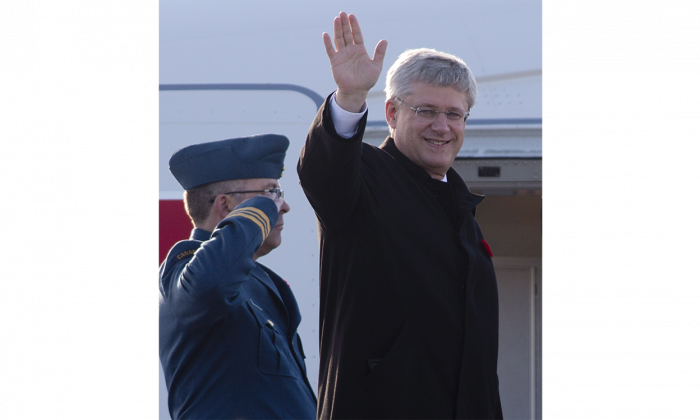 OTTAWA—Prime Minister Stephen Harper left for China Wednesday afternoon, Nov. 5. He travels there as Chinese leader Xi Jinping faces a crisis of control and critical systemic threats to his regime left behind by his predecessors. The Chinese Communist Party (CCP) was in the midst of a power struggle between contending factions during Harper’s last trip to China. Harper seemed intent on covering his bases, meeting with what many China analysts saw as up-and-comers from various factions, including Chongqing mayor Bo Xilai, the former Minister of Commerce known for his brutality. Bo would soon be purged, as this paper predicted, along with hundreds of other allies of former leader Jiang Zemin. Harper’s current trip comes as Xi claims increasing control of the regime and wrestles with a prolonged democracy protest in Hong Kong. Xi is the first real leader of the Chinese regime since Jiang Zemin despite the 10 years Hu Jintao spent at the helm. Before his term as the head of the CCP ended, Jiang took unprecedented steps to maintain control throughout Hu’s reign. He stacked the seven-member Politburo Standing Committee, the ruling organ of the CCP, with his own people by forcing one member out and growing it from seven to nine members to create spots for two more of his allies. He also had the Standing Committee changed to operate by consensus rather than giving the general secretary, Hu, presiding control. Jiang then relied on connections in the military willing to follow his lead. Jiang effectively crippled Hu’s control of the Party, but he was unable to do the same to Xi. Hu took advantage of membership changes in the Politburo Standing Committee over his 10 years in office to reduce Jiang’s influence in the committee by the time Xi took office. Aware of the threat Jiang’s faction posed to his control of the party, Xi went on the offensive early. Under the guise of an anti-corruption campaign (that also targeted others not related to the infighting), Xi systematically ousted and demoted Jiang’s allies, including top military leaders, as well as Bo Xilai, and Zhou Yongkong, the man who formerly led China’s massive domestic security apparatus. It is an unfinished process and Xi is in an unstable situation. He has removed many of the leading figures who support Jiang, but it is unclear if he has strong support among the Party’s rank and file. If Xi’s position is uncertain, so is the party he leads. The Chinese Communist Party (CCP) that has ruled China since 1949 is beset with crises and its rule hinges on three things: information control, brute force, and a pledge to continue to improve living standards. Unfortunately, the regime faces critical challenges on all fronts. The Party can no longer censor all the information coming into and leaving the country. This means information about past and present failings of the CCP, as well as crimes it has covered up, and lies it has told the Chinese people, are starting to get out. Nor can the Party use open violence to compel loyalty or at least submissiveness from the Chinese people. Anything too blatant on that front would alienate the international community it depends on for its export- and foreign investment-based economy. And while China’s economy continues to grow, it does so less quickly, with greater questions about the impact of shadow banking, a potential real estate bubble, and large-scale capital flight from the country. Meanwhile, income inequality, environmental pollution, and endemic corruption erode quality-of-life improvements that were supposed to be delivered by household income gains for a substantial portion of the Chinese people. Then there is the land issue. When the CCP came to power, it claimed ownership of all land. In the reforms, private land ownership was allowed, but now local Party officials are confiscating land and selling it for private gain. It’s a scenario that has infuriated many Chinese and sparked thousands of protests. In short, for a growing number of Chinese, the Party’s claims to be “great, glorious, and correct” have started to grate. The Party now faces a crisis of legitimacy that is compounded by rising levels of unrest. The Chinese Academy of Social Science reported in 2012 that mass incidents regularly exceeded 100,000 per year (a mass incident is a protest or riot of more than 50 people; some reach tens of thousands). The Nanjing Population Management Cadres Institute suggests the number could be multiples higher than the Academy’s estimate. Professor Xie Yielang of Beijing University, citing the security force’s figures, said there were 230,000 mass incidents in 2009. In 2012, Gary Locke, the then-U.S. Ambassador to China, told NPR that the situation in China was “very very delicate” and suggested that a major event there could trigger something on the scale of a revolution. Which leads us to Xi’s biggest challenge. There is one issue the regime has never managed to resolve—Falun Gong. The practice was widely popular in the 1990s and attracted adherents at every level of Chinese society, including the senior ranks of the Party and military. When Jiang decided to eradicate Falun Gong in 1999, official estimates in China said the practice had as many as 70-100 million adherents at the time. Despite that popularity, Jiang expected it would be extinguished in days, much as the democracy movement was 10 years prior. On the contrary, Falun Gong adherents moved from raising banners in Tiananmen Square to developing underground printing presses and created Freegate and Ultrasurf—computer programs that later became the backstop of Iranian protesters trying to get around Iran’s Internet censorship during the mass protests there in 2009. And Falun Gong practitioners continued to draw attention to the regime’s historical crimes. Amid these efforts, prisons swelled with Falun Gong adherents, and reports emerged in 2006 that the practice of harvesting the organs of death row prisoners was extended to Falun Gong prisoners of conscience. Recent reports of Falun Gong adherents being blood-typed and organ-tested even at their homes have veteran China analyst Ethan Gutmann, the author of “The Slaughter,” suggesting that the regime is looking for a “final solution” to Falun Gong. The regime has always denied allegations of torture and extrajudicial killings carried out against Falun Gong practitioners. But over the 15 years since the CCP banned Falun Gong in China, the practice has not only survived, but has spread to more countries, and the practitioners in China have continued to make determined efforts to counter the Party’s propaganda and expose the persecution. Those efforts have started to bear fruit. In some villages, hundreds of people have signed petitions calling for an end to the persecution of Falun Gong. Lawyers now take on Falun Gong cases despite threats of disbarment, and some 182 million Chinese people have heeded practitioners’ call to disassociate themselves from the CCP and renounce the oaths they made to the Young Pioneers, Chinese Youth League, and the Chinese Communist Party proper. These developments put both Harper and Xi in positions with historic potential. For Harper, business as usual requires willfully ignoring a modern atrocity once thought too horrific to be believed. After eight years of investigation, doubt or disbelief is no longer the case, and even members of his own party are publicly calling on the Chinese regime to end the practice of organ harvesting. For Xi, the disclosure of organ harvesting would likely shred what remains of the CCP’s claim to legitimacy. If Xi does nothing, events could rapidly move beyond his control. It’s not impossible to imagine that forced organ harvesting could be the scandal that would gel those scattered protests and riots into a mass movement. At this critical moment, Harper’s every word and handshake in China matter. His presence is a soothing balm of legitimacy the CCP craves. He must wield it carefully. Conferring legitimacy on a regime facing widespread unrest and guilty of horrific crimes is the kind of political miscalculation that will tar a PM’s historical legacy. Xi meanwhile, is standing at a crossroads. He didn’t start this gruesome trade, but he could be the man to stop it. Whether the CCP could survive that effort is another story.